AMS Neve RMX16 RMX-16 Reverb, refurbished, works & sounds great! The classic AMS RMX 16 stereo reverb, refurbished by the AMS experts at Studio Electronics. Marshall 5002A Time Modulator, Near Mint, Full Recap & Refurb, Sounds Great! AMS Neve DMX 15-80S Delay Harmonizer. Refurbished, works great. The classic AMS DMX 15-80S Delay / Harmonizer, refurbished by the AMS experts at Studio Electronics. Marshall 5402 Time Modulator, Near Mint, Full Recap/Refurb, Works/Sounds Great! Improved version of famous 5002, super rare, beautiful!. Here's a never used excellent example of the very rare Marshall 5402 Time Modulator. Here is the rare and very cool Eventide Instant Flanger, model FL201. Marshall AR-300 Tape Eliminator Near Mint Full Recap/Refurb, Works/Sounds Great! Here is a beautiful, near mint pair of dbx 165A Compressor/Limiters. Nice Eventide H969 Harmonizer / Delay, Serviced & Fully Tested, Sounds Great! 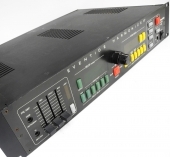 For sale is a dbx 208 8-channel chassis with power supply. Eventide H3000 Ultra-Harmonizer, Kitchen Sink/Plus+ Upgrade, Refurb, 777 Presets.